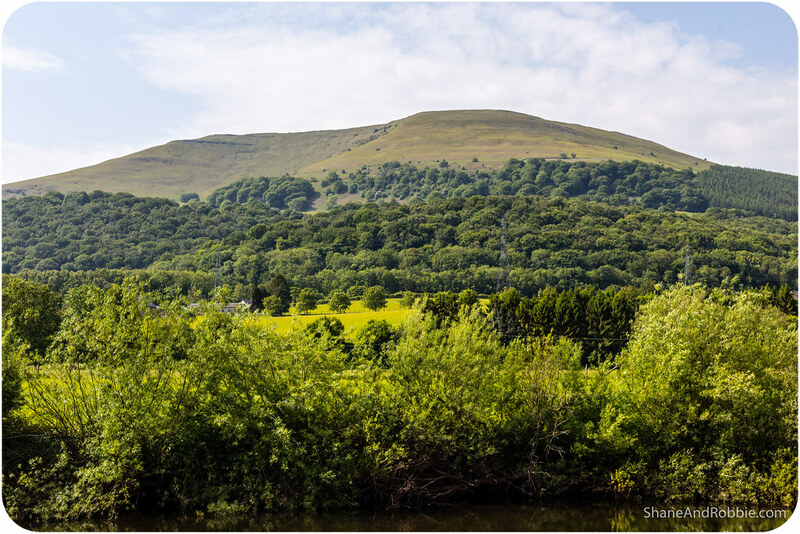 There’s no denying that the Brecon Beacons National Park is beautiful – it’s a glorious mix of high moors, green valleys, fresh clear rivers, and quaint farming villages. We could easily see ourselves going back to the Beacons for a dedicated hiking holiday, to walk all the way from one end of the national park to the other enjoying local fare and the uniquely Welsh hospitality along the way. For now, however, we’ve decided to make the great leap across St George’s Channel and move on to Ireland. Rather than fly we decided to book ourselves on to a ferry – it’s so much more scenic that way (and after so many internal flights through China, we’re a bit over the flying thing). 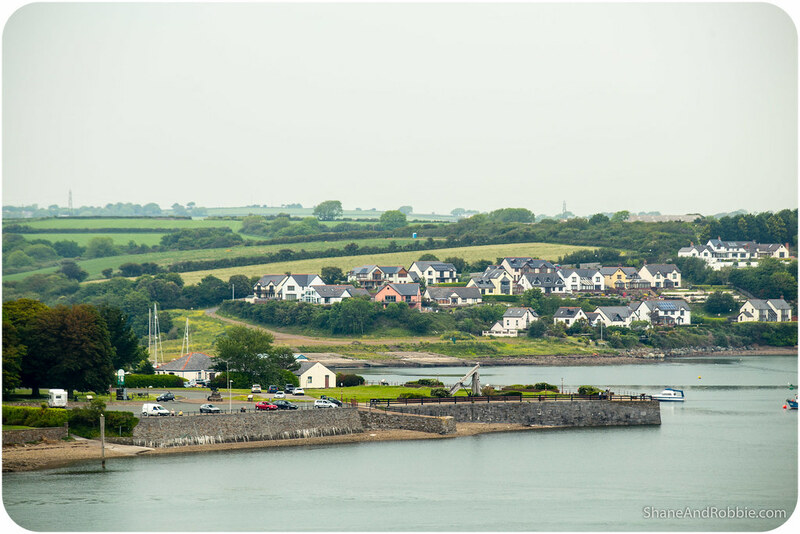 Most of our morning was, therefore, spent getting from Brecon to Pembroke Dock, the port-side Welsh village the Irish ferries leave from; our afternoon was then spent aboard the MS Isle of Inishmore, bound for in the Republic of Ireland. Making the 2:00pm ferry from Pembroke Dock meant an extra early start this morning* to ensure we got on the first bus back from Brecon to Cardiff. We had the bus to ourselves most of the way and enjoyed our last views of the Brecon Beacons by the light of the early morning sun**. *We’re generally early morning people anyway, but 5:00am is early even for us! **We missed dawn, even with our early start – with the Summer solstice so close, dawn is about 4:30am here at the moment (sunset is just after 10:00pm). Two hours later we were back in Cardiff, sitting at the train station enjoying a coffee along with the morning commuters. 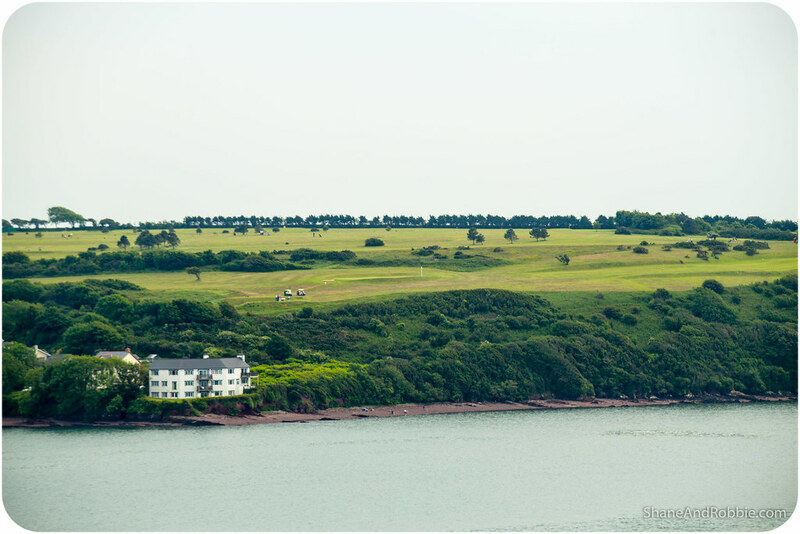 The train took us from Cardiff Central to Pembroke Dock, past the ubiquitous rolling green hills of Wales, alongside the beaches of western Wales, and through the seaside holiday towns of Barry, Swansea, and Tenby. We reached Pembroke Dock around lunch time and enjoyed a tasty, simple lunch in a local eatery before hucking our packs across town down to the pier. The town itself was pretty nondescript and consisted of not much more than a couple of rows of identical worker’s cottages lined up along the main street. Talking to the owner (and head chef and waitress) at the place we ate at, we found out a little about Pembroke Dock’s history. The natural harbour Pembroke Dock is situated in has been used by fishermen for many thousands of years; from Celts, to Vikings, Romans, Normans and English, the harbour has long been a shelter from the prevailing south-westerly winds. In the 8th century a small fishing village known as Paterchurch was established. The town remained fairly low key until, in 1814 a Royal British Naval Dockyard was established here. 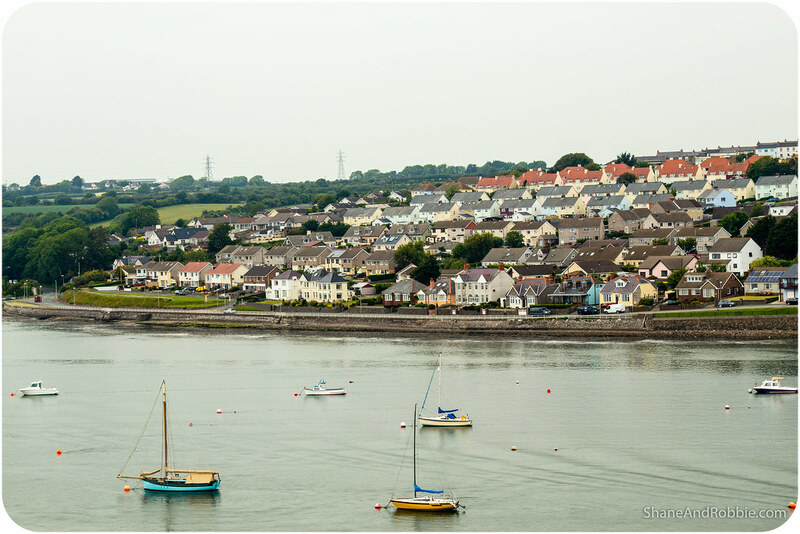 Over the span of 112 years a total of 268 Royal Navy vessels were built in Pembroke Dock and the town flourished. Unfortunately for Pembroke Dock, however, the tides turned and the last ship launched from the dockyard in 1922. In 1925, it was announced that the Royal Dockyards at Pembroke Dock were redundant and would be closed. This started the town’s decline. Today the town is one of the poorest in Wales, with high unemployment and little infrastructure. 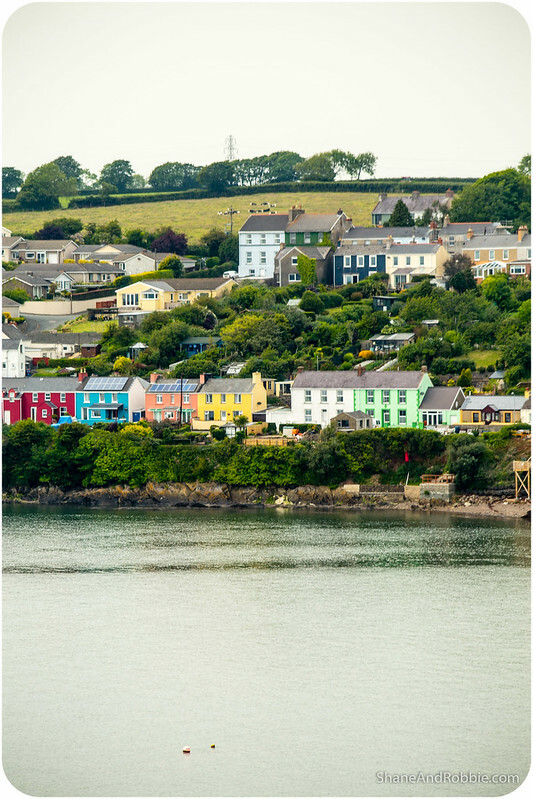 It’s little more than a dock for the inter-island ferries that go between Wales and Ireland, with a train station and a few guesthouses and cafes catering for tourists just off the ferry, or on their way to the docks. We could definitely see, even with the short amount of time we were in Pembroke Dock, that the town was a little worse for wear. We knew there would be some towns like this in Wales, however, as economic hardship is a harsh realty in many parts of this country. As coal mining and heavy industry wound down operations throughout Wales in the 20th century, many towns, like Pembroke Dock, have struggled to remain vibrant and relevant. Expecting something and actually seeing it are different things however, and it was quite a shock in some ways seeing how lack of industry and limited employment opportunities can affect a town. To be honest we were glad to board the MS Isle of Inishmore, bound for Rosslare. 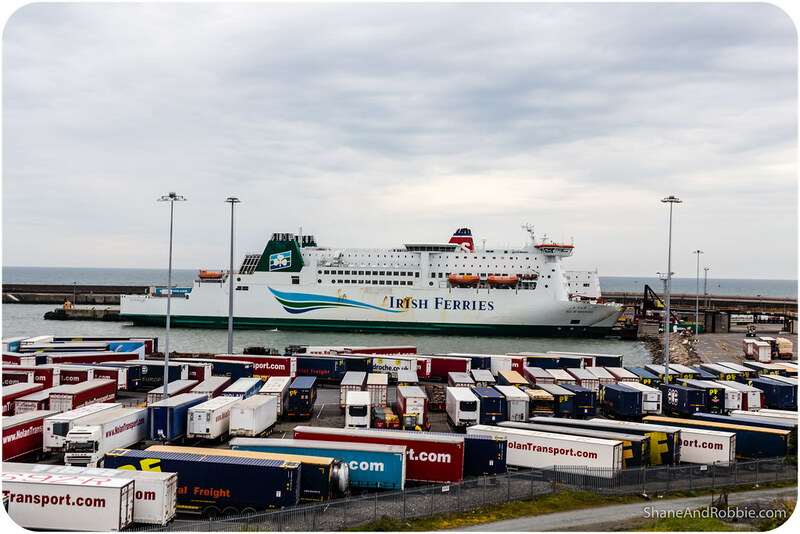 The ferry was massive – it can carry up to 2,200 passengers and almost 1,000 cars. It was virtually empty today though; just us, a few trucks, and a coach load of “package tourists” from the USA. Not only were we lucky enough to have the ferry to ourselves, but the channel was flat as a mirror. We had a great crossing with hardly any swell and no wind. The worst thing that happened was that our perfect blue skies disappeared behind a bank of clouds for the afternoon and we left Wales under cloudy skies. Not that we’re complaining – the weather has been impeccable over the past week! Our final view of Wales (at least for a little while) were of St Ann’s Head and the islands of Skokholm and Skomer as we sailed into St George’s Channel. 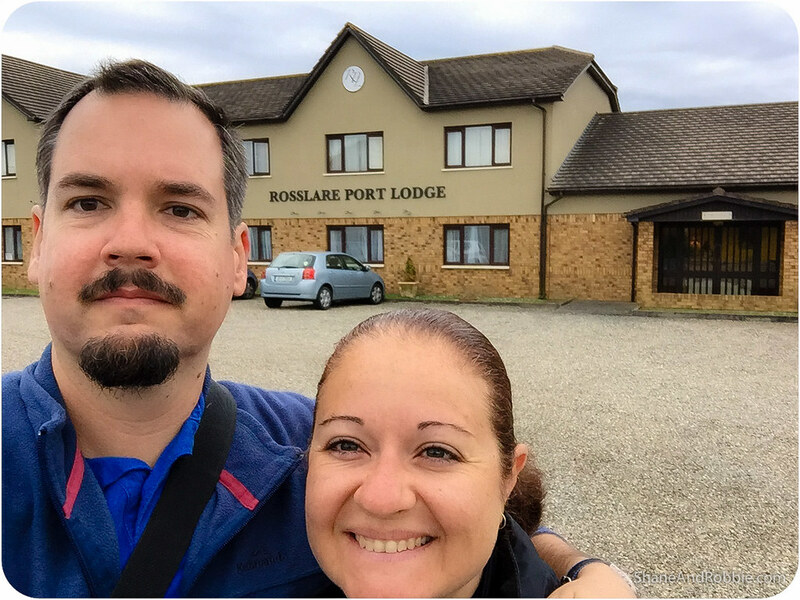 After a total of 4 hours sailing we pulled into Rosslare harbour. This tiny port town is our home for this evening because, after 12 hours in transit, we’re spent and looking forward to a hot shower, a warm meal, and a good night’s sleep in Eireann (aka: Ireland). *Like most Australians Shane’s a “bitsa*” but there’s a good whack of Irish in there. That is, Shane’s family lineage contains all sorts of “bits and pieces “ – bit of English, bit of Danish, bit of Russian, bit of French, bit of Irish; as Shane likes to put it: he’s an Aussie, made locally from the best of imported ingredients.